Currently, I own KTM 690 DUKE. It is a reliable guy who performs from ordinary commuting to a little tooling. It is the first foreign-made, foreign manufacturer I bought and it is also the first big bike in my life. Here I would like to tell you what it is like to actually ride from the process of purchase. Although I acquired a large motorcycle license a few years ago, I did not particularly have a willingness to purchase. I owned a 250 cc motorcycle for many years but after two years I have been away from the bike for nearly two years. However, gradually started to feel boredom in everyday life, initially started around the bike shop to buy a bike of about 400 cc. It was absolutely necessary to be a lightweight on-road vehicle because I was planning to use it as a leg of my daily life. I dropped by a bike shop where Orange stands out by chance while turning around various bike shops. Yes, it is an Austrian bike maker KTM. At first I was going to sign a contract with 390 DUKE, but 690 DUKE caught my eyes just before, I fell in love at first sight and reached a contract. Even when compared with 390 DUKE, the weight of the car does not change so much, and the desire to have a rare large single-cylinder motorcycle now became a decision. Impression that vibration by a single cylinder engine was very strong. I felt it was difficult for the shift change timing to be like a stall unless it was done from at least 3,000 revolutions per minute at each speed. Although the seat height was 835 mm, I was able to land with my feet with a foot height of 173 cm. The current mileage is about 4,000 km. I usually use it for commuting and I am also going touring with about 200 – 300 km in mileage. When I first bought it, my hands were hurt by vibrations caused by thrusting peculiar to the big single engine, but I got used to it in about 2 to 3 months. About the vibration of this engine, it is remarkable especially when driving on a highway. The side mirror becomes useless due to vibration when it is about 80 to 100 km. In addition, because of this vibration of the in-vehicle movie, too much can not be expected. However, I am very satisfied with the driving performance itself. Because it is lightweight but there is so much power, it reacts quickly to the rise from cornering. I can not expect the maximum speed, but I think that it is a motorcycle that can enjoy acceleration feeling instead. Although it may pass through the residential streets when commuting, you can pass the road that can only pass by the original scooter without problems. Also, because it’s lightweight and small turning, it is not too much trouble to put in and out even on a small site. (You can force it to slide with light technique as it is light.) I would like to tell you the impression below. The weight of the car is 148.5 kg by dry weight. This is a very interesting figure at 600 cc and above and has obtained the result that it is lighter than the MT – 07 of YAMAHA by 30 kg or more. Since the output is 74 ps and both cars are almost the same, if you compete for speed, 690 DUKE will be easier to dominate. Motorcycles over 600 cc are almost not available unless you pay more than 1 million yen, but this 690 DUKE is sold around 900,000 yen on new cars. We can not see you at all because we can enjoy full – scale sports driving at a relatively cheap price. I use high-octane gasoline, but the fuel consumption will constantly beat out over 30 km / L. There was not much change in fuel consumption even if we did some sports driving at the rugged pass. On the contrary when I commute to work except DUKE I feel like starting a day from the state I got through. It is a motorcycle that consumes oil very much. It is not as good as a two-stroke engine, but if you run about 2,000 km after changing, the oil amount will be reduced more than half. Replacement and replenishment are required at around 1,000 to 1,500 km. Since the oil change itself is essential, it feels more troublesome than the two-stroke engine which requires only the addition of oil. When you do with a dealer, it costs around 10,000 yen. As mentioned earlier, the vibration of a large single cylinder engine is very large, and when the vehicle is running at high speed, the side mirrors may not be usable. Vibration is intense at 4th gear 5,000 rpm, around 80 to 100 km. There is no torque for the second speed or more and 3,000 rpm or less, which makes the engine easier to stall. You must be careful not to make a mistake in choosing gears during low-speed running or cornering in a residential area. As mentioned above, the seat height is 835 mm and the feet itself does not matter, but since it interferes with the calf portion in the genuine step, it is necessary to attach legs to the thigh. As it was unexpectedly unstable to the sense of distance to the ground, I was replaced with an optional backstep at the moment. This made the footstooth became smoother. Originally it is based on a racing engine, so summer is the worst in the summer. Again, summer is the worst. Even outside summer, overheating is likely to occur at temperatures above 20 ° C. Once the electric fan runs with a water-cooled engine, as this circles around, a very hot hot air will strike the body, so it will make you conscious just by riding for 30 minutes. Coolant liquid may also be better supplemented and checked once when one year or one summer passes. “690 DUKE R” is released as a manufacturer’s official custom vehicle from KTM. In this vehicle, the power parts used as options are standard equipped from the beginning. The difference from 690 DUKE is below. These are equipped as standard, and more tuned for racing. People who are supposed to run on the circuit from the beginning seem to get DUKE R as soon as possible. The price is about 1.3 million at the launch of a new car but I think that it is a bargain in consideration of the difference with DUKE.However, the strength of DUKE against DUKE R is that custom freedom is high. The pleasure of making it from scratch probably will produce value and pleasure that money can not buy. Also, some people have the impression that DUKE chooses a rider depending on the person because only a limited number of electronic control devices are installed. * 690 DUKE R seems to be a production cutoff in the 2017 model. New car purchase as soon as possible. The other day KTM officially decided to release 790 DUKE in 2018. This model succeeds to 690 DUKE, seems to generate more than 100 ps with a 799 cc water-cooled two-cylinder parachute engine. The weight of the car is 169 kg ~ and its lightness is alive, and the latest electronic control system and mode control are firmly introduced. As dealer says “I will continue to sell together at 690 and 790 for a while, but I will shift to 790 for a while”, 690 DUKE seems to be destined to disappear. However, the LC4 engine itself has been introduced in other models, so there is no possibility that the KTM traditional single engine will disappear. Originally, this 690 DUKE also began at 620 DUKE (1994) at the beginning, so it may be time to change the model by increasing the displacement. The image of my personal bike shop is working while a sweaty osan is whisked. I had an impression of dirty feel somewhere. However, the KTM dealer who is always indebted has many female staff. Of course, the bike is on sale at the shop, but the shop has a sense of cleanliness as “It’s really a bike shop” or “It can be opened as it is at Cafe”. It is a world unrelated to a salesperson who comes in with a great attitude and a mechanic who releases a shady atmosphere. Of course, female staff is improving. Male staff is also youthfully responsive and polite. An atmosphere not like a bike shop is also an interesting point! 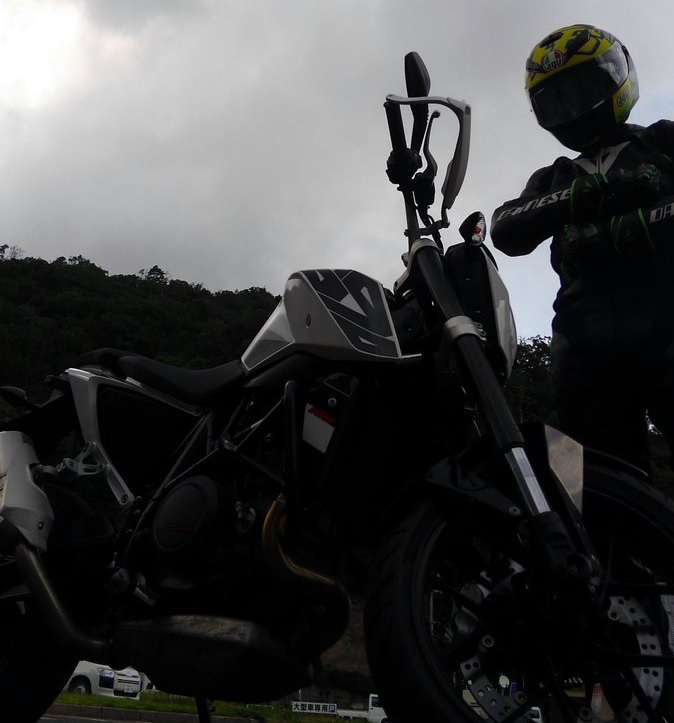 KTM 690 DUKE is never an economic bike compared to domestic cars. The frequency of maintenance is high and the parts cost is reasonable price. However, it is also true that there is unusuality to get in exchange for it, and it is a bike that I can definitely recommend for those who can say it well. I became a return rider with this motorcycle, but I feel that it is pleasant even in a time-consuming and time-consuming process. It can be said that this moment is “the time when the most motorcycle in life is enjoyable” now. For the time being, I would like to ride while enjoying various things until the next vehicle inspection. If you are interested in DUKE or KTM and you are not sure what to buy, please try going to the test drive by all means. I think that I will never lose even just going!